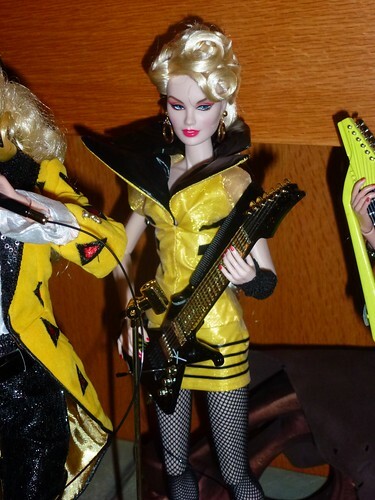 When I was a child watching the Jem cartoon, Rapture was the member of the Stingers that interested me the least. It might be because she never really got a focal episode. “Riot’s Hope” introduces us to Riot’s disapproving father and loving mother, and shows us the more sensitive side of Riot, as well as the strong bonds that unite the Stingers. “A Change of Heart” shows us Minx at her most vulnerable, trying her best to do good and rise above her “bad girl” past. Rapture, meanwhile, is the same in every episode. She likes to play tricks on people and is a scam artist. That’s about it. 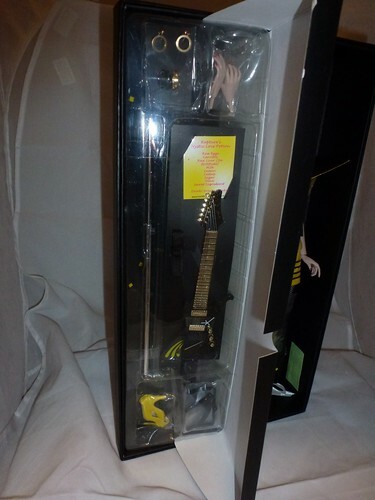 Until I opened her box, I wasn’t even sure what instrument she played in the band. Wasn’t she the lead tambourine? Or maybe the back-up vocalist? As it turns out, she plays guitar. I was delighted and surprised to find that Rapture was my favorite of the Integrity Toys Stingers dolls. 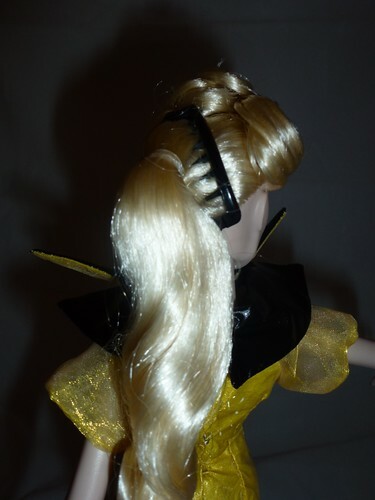 Her outfit is unapologetically cartoony, with improbably large black collar and shiny yellow-and-black top contrasting with her fluffy chiffon sleeves. She’s side-glancing in the opposite direction from Minx, and her hair is gelled into perfect curls. Her silky golden locks are pulled into a ponytail in the back, with a black banana clip helping to hold everything in place. As someone who has always had trouble with hair styling, I am in love with how Rapture is rocking this banana clip. 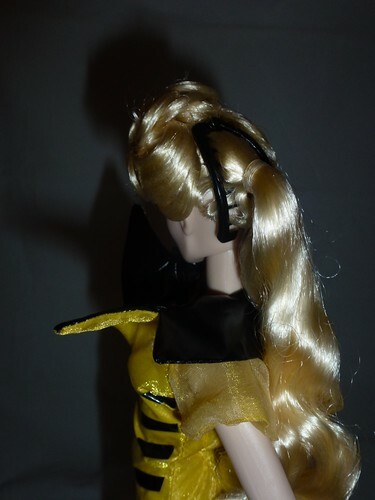 Rapture’s accessories include the gold version of Minx’s earrings, two black and one gold metal bracelets, extra hands, yellow high-heel pumps, black and gold guitar, and a print out of the special love potion she gave to Pizzazz (with raw liver, “for fortitude”! )… plus a stand, and a fishnet gauntlet in a plastic bag taped to the outside of the “dressing room”.